There are days when I really wonder about my brain or better yet….”what was I thinking?” Can you relate or is it truly just me? 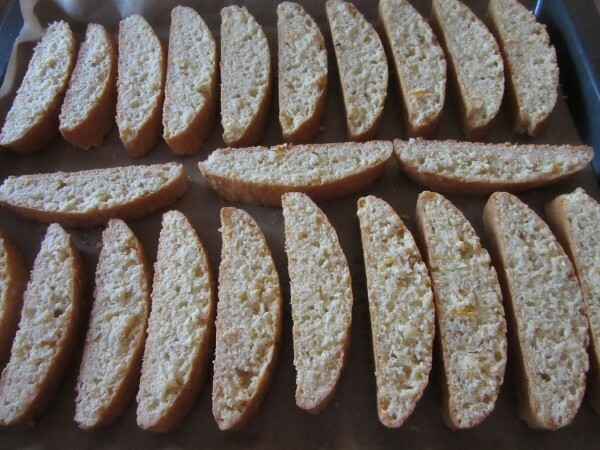 Yesterday I decided I wanted to create a recipe for Biscotti using Hazelnuts and Orange Zest because Hazelnuts are very common in Bavaria and I love orange flavored anything. I’m not a huge chocolate fan ( don’t hate me, please? 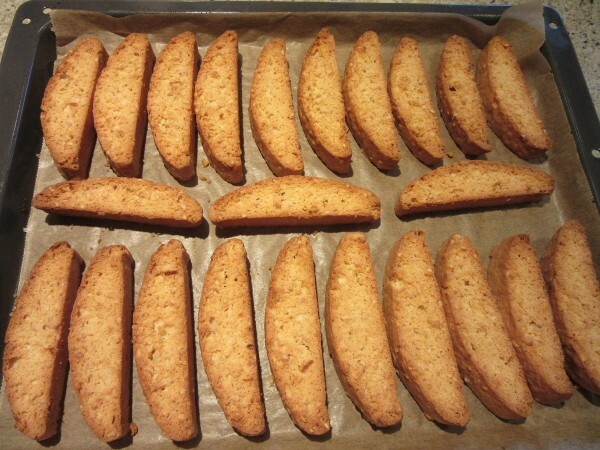 ), and recipes for Almond Biscotti are everywhere. I wanted to do my own thing. Sooooo……I decided not to photograph what I was doing as this was “just an experiement.” Wrong! Oh…So…Wrong! Half way through creating this Biscotti I realized it was coming together very well ( who knew?). It tasted just fine and I finally decided to start taking pictures! Sigh……today my friends, I give you a whole recipe with only half the pictures. But…they are truly the best pictures of the best part of the recipe. You really don’t want pictures of me melting butter or measuring flour, right? Thanks for putting up with my goofiness and I bet you’re going to LOVE these Biscotti! Coffee was made for Biscotti or Biscotti were made coffee. However you view it, don't miss this fabulous crispy, orangey, nut filled dipping biscuit! First you get the Orange. Then the Hazelnut and lastly that Ginger sloooowly comes forward. Truthfully, I enjoyed my first two sans coffee and then I dunked the third! Sparky said these were the best Biscotti he's ever tasted. Quite the thumbs up from Mr. Idonotlikecitrus! Pre-heat oven to 350 degrees and put a rack in the center of the oven. 3 TBSP Brandy yep...that's right! 3 Large Eggs slightly beaten with a fork. In a medium sized bowl, stir together the melted butter, sugar, brandy, and Vanilla. Then stir in Orange Zest, Hazelnuts and slightly beaten eggs. In a medium bowl, combine flour, baking powder and salt. Then add to the above mixture. Stir with a spatula or wooden spoon until combined. Cover the bowl and refrigerate for at least 30 minutes or until you're done running the vacuum cleaner. PLEASE invest in baking paper to line your baking pan. This will make your life sooooo much easier! Place baking paper on a large cookie sheet. Divide dough in half. OK.......this is where it gets tricky, but follow along and I'll make it easy. Most recipes complain about how sticky the dough is and they are right! Yucky,,,Sticky, but they all say to make sure you add a ton of flour to your board and hands and and and..... UH HUH! Nope, Do Not Listen! Instead ( trust me here, I would not lie to you), WET your hands good! Yeppers, wet 'em! Then divide dough in half and plop each half on your cookie sheet. Working quickly with wet hands, push and shape the dough into 3 inch by 12 inch logs. Pat the tops with your wet hand to smooth. It does work and works well without adding all that extra flour to your dough! Place on the rack in the middle of your pre-heated ( 350 degree oven) and bake for 30 minutes until pale golden. Cool on a rack for 15 minutes. THIS is important! Cooling means they will slice better. Not too cool and not too hot. Transfer to a cutting board and slice into 3/4 inch pieces. Re-line your baking sheet with baking paper again. 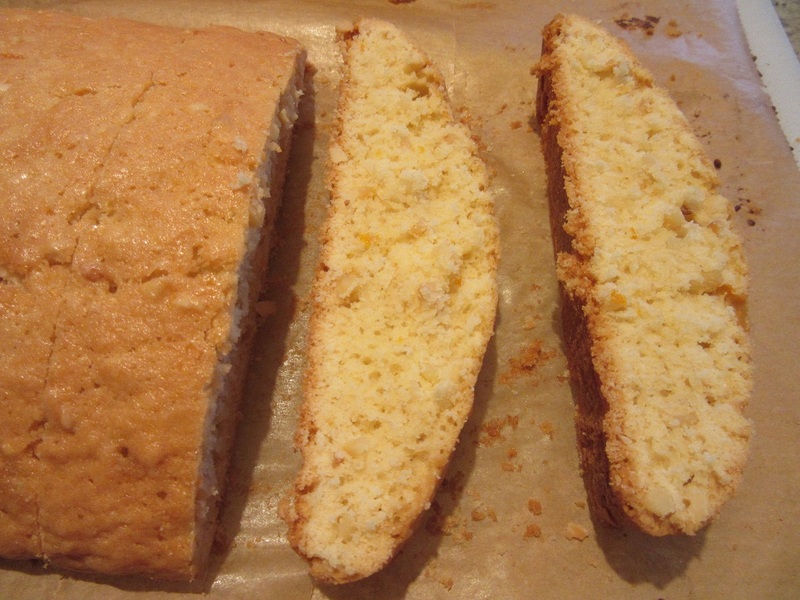 Lay each slice of Biscotti with a cut side down on the baking sheet. They don't spread so you can place them close together. Bake for 20-25 minutes until golden. Transfer to a rack and let cool completely. If you are a virtuous person, set them aside in a closed tin or zippered lock bag for 24 hours to "improve" the flavor. Or like me and Dan, fix a cup a coffee and start dunking! 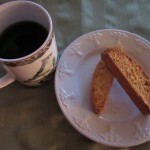 Yummy…This is very similar to my biscotti except mine is orange-almond. I’ll have to try this recipe. 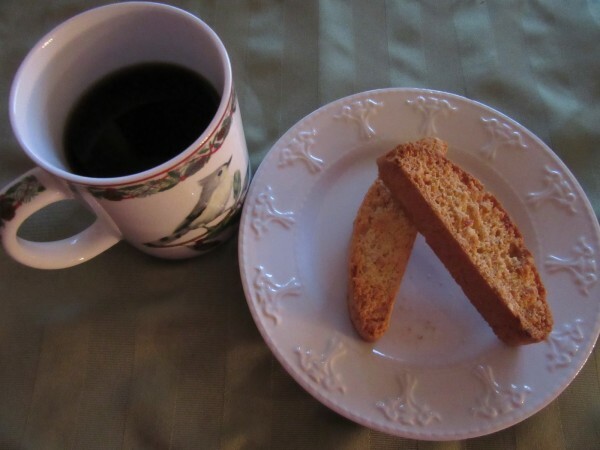 I love biscotti with my coffee. 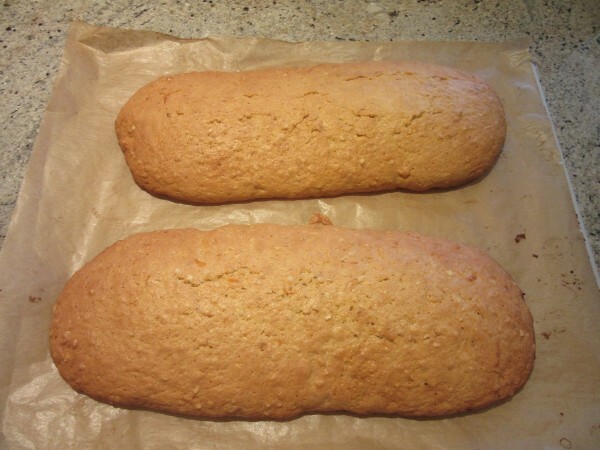 I also have a recipe for anise biscotti. Love that one too. I hope you do get to try these Sharon. I think the Brandy adds another layer of flavor to it. I’ve never made Biscotti before. Karen, The Journey Girl and the friend who misses you!